A tip of the proverbial cap to Brandon Beachy for his stellar performance last night! Brandon pitched his first complete game, a 7-0 victory over the Marlins. It took Brandon 122 pitches and he was strong the entire outing. So strong in fact, that there wasn't any bullpen activity until the 9th inning. And that was 'just in case' activity. We're definitely seeing a more mature and confident pitcher this season. After the game Brandon said he has purpose in his pitches. He went on to say that he's throwing right where he wants to, he's going deeper into games and he's getting batters out earlier in the count. A knowing observation/compliment came from the one teammate who's seen countless players come through the Braves locker room. Chipper Jones said, "It's fun watching young players going from wondering if they belong, to thinking they might belong, to knowing they belong. Brandon is starting to know he belongs." Brandon took his minuscule 1.60 ERA down to 1.33 by game's end and helped his own cause with an RBI single in the fifth. That's his 4th RBI of the season. There is one other stat from the game that makes me extremely happy. Each of the Braves seven runs were knocked in by seven different batters. That's what we need to see all season long. Tonight the Braves face the Rays in their first interleague game of the season. It's going to be a tough weekend. The Rays are 14-3 at home. However, the Braves are 14-8 on the road. This should make for a very exciting series! In an attempt to make ammends for thinking that there may have been an alterior motive in the scheduling of Tony LaRussa's jersey retirement, I want to give all of you the opportunity to watch the ceremony, courtesy of the Cardinals MLB website. It was a really nice ceremony for one of baseball's most influential managers. Next stop Mr. LaRussa...Cooperstown. This Braves team has something special. They're resilient. They don't panic, they fight back and they don't give up. I'm not saying that past Braves squads haven't been this way, but this group has a little something extra. An extra spark. Some oomph. That certain je ne sais quoi. More something. A lot of words can be used to describe it. I can't quite put my finger on it but whatever it is, I really like it! Wait, it just hit me. Clutch! I've been planning on writing this post for well over a week, since that amazing Wednesday night win versus the Phillies. Then there was the Colorado series. And now the St. Louis series. The comebacks keep coming. This is the team I know and love. This is what Braves baseball is all about. The Wednesday Phillies game had me on the edge of my couch. Coming back from a 6-0 and then a 12-8 deficit, going into extras and then the game being capped off with Chipper's walk-off home run in the bottom of the 11th had me barely able to sleep. It was almost poetic having Chipper tap that final nail in the Philly coffin with his walk-off home run. My only worry at that end of that game was the crazed mob of Braves players waiting for Chipper at home plate. I caught myself saying aloud, "Don't hurt him! Don't hurt him!" What a game! Not only the two comebacks, but knocking Roy Halliday out of the game early and never looking beaten. There was so much confidence in that dugout. Those are the Atlanta Braves I know and love. And then the Colorado series. A sweep? Seriously? I keep my expectations realistic when the Braves are in Denver, for obvious reasons. But coming back from being down 5-0 to win 9-8 in 11 off of an Eric Hinske home run in Friday's game and then Saturday coming back from a 6-2 deficit to win 13-9, fueled by back-to-back home runs from Matt Diaz and Jason Heyward and an angered Chipper Jones. Wow! Now the Braves are in the middle of a series facing the best hitting team in the National League and reigning World Series champs, the St. Louis Cardinals. The Braves hadn't won at Busch Stadium since 2009. Friday night's 9-7 come back win in the twelfth included a Jason Heyward 2-run homer, the first save in Livan Hernandez's long career and a stellar bullpen performance which had the Cards leaving the bases loaded twice. The Braves are finding ways to win and it's coming from everyone. Everyone is making big contributions. We've seen Dan Uggla start the season as the Dan Uggla we expected when the Braves signed him. We're watching Jason Heyward put last season in the rear view mirror. We're wishing we had Michael Bourn all of last season and hoping the Braves re-sign him at the end of this year. 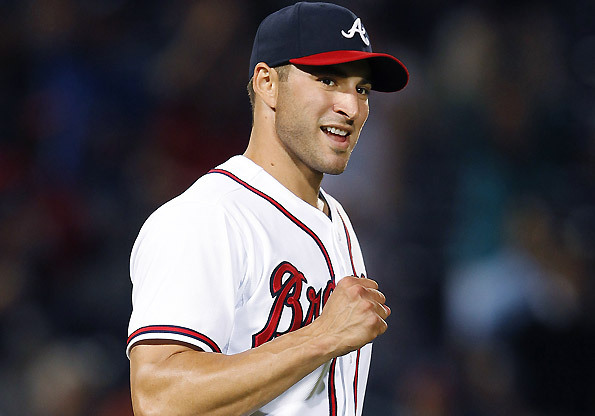 We're witnessing Mike Minor and Brandon Beachy mature before our very eyes. We're watching Freddie Freeman campaign for his first All-Star appearance and Tyler Pastornicky working hard to prove that the Braves chose the right shortstop. We're seeing amazing performances off the bench from Eric Hinke, Matt Diaz and Jack Wilson. And we're watching Chipper Jones do what he has always done, lead the time by example. And as an aside, I love it when Chipper gets ticked off. His reaction and comments to Jamie Moyers' sign stealing accusations were priceless and spot on. Yes Chipper, the Braves do play the game the right way. I can't decide what I think about this. 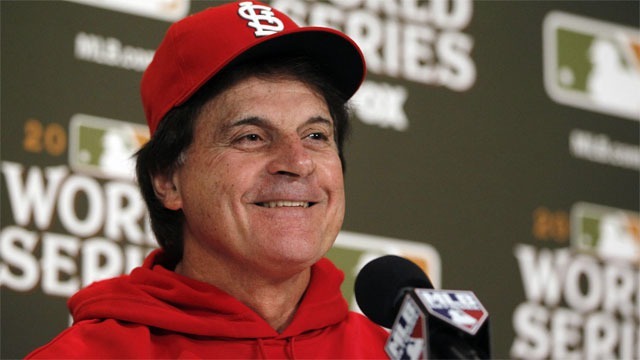 Before the Braves take the field in St. Louis tonight, the Cardinals will retire Tony LaRussa's number. It's a well-deserved honor. But something is gnawing at me. Is the timing of this ceremony suspicious or is it simply coincidental? Let's remember how last season ended. In extra innings, the Braves lost their final game of the season to the Phillies. The loss made a one-game playoff versus the Cardinals for the Wild Card spot a moot point. The Cardinals were catapulted into the post season and eventually became World Series Champions. I know he's been called The Natural many times before, but honestly, have we ever seen a modern era baseball player like Josh Hamilton? I don't think so. Off the field his story is one of struggle and redemption. On the field, it's one of unparalleled accomplishment. Just when you think Josh can't out-do himself, he does. And he did it again last night. Josh hit not one, not two, not three but FOUR home runs against the Orioles. And they weren't cheap home runs. Each landed in either center field or left center field. I don't think the average sports fan realizes what a tremendous feat this is. I'm guessing that most believe the toughest thing to do in baseball is to pitch a perfect game. Yes, that is extremely hard to do and a perfect game has only been thrown 21 times in baseball history. Hitting four home runs in one game? That's been done only 16 times in the history of the game. For those who are mathematically challenged, that would be five fewer times. By the end of the 10-3 Rangers win, Josh Hamilton had hit four home runs and one double, all of which resulted in 18 total bases. The long-standing American League record of 16 total bases in one game was shared by six players. Who did Josh surpass? Well, two of the six are Lou Gehrig and Ty Cobb. Not too shabby Mr. Hamilton! Always humble, Josh described his performance as "a blessing." Afterwards he said, "Just seeing how excited my teammates were, then touching home plate and going into the dugout, the reaction from them was the best part." He went on to say, "You don't go out and try to do that. You just try to do the best you can, and if you break a record ... great. You don't try to do that, you try to be the best player you can be for yourself and your team." I've always thought of the Rangers as a very cohesive team, one that has hung together and stuck together through some heartbreaking losses and trying times. That makes their successes, both team and individual, even sweeter. "The best individual performance I have ever seen," said Rangers infielder Michael Young. "I've never seen anything like it. It was fun to be a part of. He's an incredible player." He continued on to say, "I don't know if we'll ever see something like that again." At the end of the season, Josh Hamilton will be a free agent. Nolan Ryan, you better find a way to re-sign that boy! Here's the list of the Elite 16. It's no secret that I despise the New York Yankees. The despise goes deep. In fact, I can say that the Yankees are, without a doubt, my least favorite team in all of sports. Not just baseball, all of sports, amateur and professional. I was shocked this morning, when I heard that Mariano Rivera had torn his ACL while shagging flies before last night's game in Kansas City. A torn ACL means the end of player's season. In Mo's case, perhaps the end of a career. The depth of how much I despise the Yankees, if you could somehow turn that around, that is how high my respect and admiration for Mariano Rivera goes. The adjectives are endless. Amazing, Brilliant, Fearless. He is without a doubt, the greatest closer in baseball history. The advantage he gives to his team is without compare. It's as if you have only eight innings to beat the Yankees. Once you hear "Enter Sandman", you're done. That steely stare, that blazing cutter, the inning lasts but mere moments. I have never seen another closer even come close to doing what Mo does on a nightly basis. I watched the video of when the injury happened and it looked like nothing. Mo went to catch a fly ball and suddenly, he crumpled to the ground in extreme agony. One of the players taking BP pointed to the outfield and Joe Girardi and the trainers were out there in a flash. Mo was carted off and that was it. During spring training, Mariano said he would announce mid-season whether he would retire at the end of the season. He'd already decided, but he wasn't sharing. At 43, he's had a great career and he's one of the few Yankee players left from the glory years of the late 90s. But what now? I don't want to see Mariano Rivera go out like this. He deserves better. I'm reminded of a Braves/Astros game in 2010. It was late August and we were all wondering if Chipper Jones would announce his retirement at the end of the season and walk off into the baseball sunset with Bobby Cox. Then, during a routine fielding play at third, Chipper was suddenly on the ground, writhing in pain. Torn ACL. Done for the season. Maybe forever. Just as I didn't want Chipper's career to end on an injury, I don't want Mo's to either. I'm sure we'll hear his decision soon. I hope it's what I want to hear. Mo, don't let it end like this. You deserve better. After I completed this post, I learned that Mo has said he will be back for the 2013 season. I have an old adage in my head...be careful what you wish for! Nah, I still want Mo to come back and I still don't like the Yankees. I caught a fascinating story on the NBC Nightly News last Thursday night regarding Ted Williams and his personal memorabilia. Over 800 items were up for auction this past weekend. I couldn't believe that Ted's family would be able to part with some of these items. To collectors, they are beyond imagination. A baseball, autographed for Ted by Babe Ruth. The inscription reads, "To my pal Ted Williams, From Babe Ruth." Seriously!?! Also included in the auction are Williams 1949 American League MVP Award and a silver bat for winning the AL batting championship in 1957. 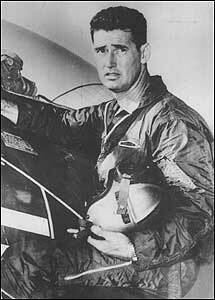 But Ted Williams was not just a baseball player, he was a soldier (fighting in both WWII and Korea), an avid fisherman and hunter (he's in the fishing hall of fame) and a devoted father. All the items in the collection reflect this. Included are his uniform and photographs from his time in the Marine Corps, letters from presidents, his golf clubs, household items and even a collection of wooden ducks. So what's the back story on this? 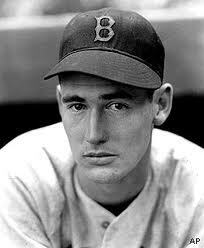 Ted Williams had told his children that he wanted to auction off items that he had saved from his playing days with the Red Sox, as well as many other personal items, donating the proceeds to charity. He had always been amazed at the amount of money that people would pay for such items and he knew that the money could help those in great need. Claudia Williams, Ted's daughter, is honoring that wish. The Jimmy Fund, a charity affiliated with Boston's Dana-Farber Cancer Institute for which the slugger helped raise money during his lifetime, will be a beneficiary. 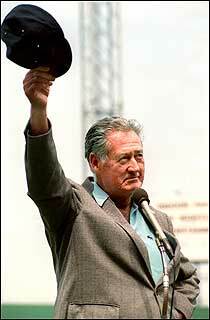 Ted Williams passed away in 2002. His son in 2004. That left everything up to Claudia. Claudia was born 11 years after her father retired from baseball. She never realized the impact he had on others until she attended an Old Timer's game as a child and she saw the fans reaction to him. Remembering that, she put a great deal of her heart into the auction. She felt it was extremely important that all of her fathers fans would have the opportunity to see these treasures. And this is the coolest part! All of the items to be auctioned were put on display at Fenway Park so that Ted Williams' fans, Red Sox fans and baseball fans could step back in time and peer into the personal life of one of the games biggest legends. Fans travelled hundreds of miles to see all the different sides of their baseball hero. There was a great deal of thought put into the timing of this and it's no coincidence that this peek into Williams' world is in the year that marks the 10th anniversary of his death and 100th anniversary of Fenway Park opening it's gates. Here is a link to watch the story from NBC News. Here is an interview with Claudia Williams. Here is a short interview with the auction house president.